SureMix® CO2 — The New Benchmark in Silica Compound Processing. 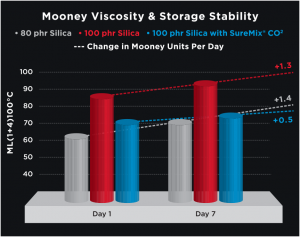 By using SureMix®, tire companies have been able to increase silica loading by 20-30% while maintaining processability. Higher loadings improve tire handling and wet grip — a key safety parameter. Additionally, the viscosity reduction has been leveraged to support the adoption of higher surface area silica’s, which helps close the gap on carbon black reinforced tires. Even though SureMix® was developed for silica compounds, similar benefits have been observed in carbon black formulations, significantly increasing the applications and strike zone for SureMix®. If you need to optimize silica compound processing without compromising performance, We Can Help.